Basement Marmoleum Linoleum Floor? Read this first. So it’s time to finish your basement flooring. With endless options on the market, you want the one that is safe for your family, won’t break the bank, and is environmentally-friendly. Look no further than Marmoleum Click 3 Cinch Loc. While Forbo makes glue down tile and sheet options, their click together product is so versatile and suited to many dry basement projects. Is Marmoleum Click 3 the best flooring for your basement? Maybe, maybe not. Let’s find out. The first and most important step is to assess your subfloor conditions. This is a job for the person responsible for the installation and who should be able to guide you. Green Home Floors is one of those suppliers who can offer some advice and help you to purchase the products. Before Marmoleum Click 3 is installed, there are a number of factors to look at, especially for basements. From dampness to whether the floor is level, pitched or lumpy and bumpy, Marmoleum Click 3 should only be installed if it is the right fit for your specific situation. Forbo, the manufacturer of Marmoleum Click 3 Cinch Loc, suggests checking the relative humidity in the concrete slab or the moisture content percentage as a means to determine suitability for installation. Click product has a wood core and does not perform well in damp environments. Sometimes a vapor barrier can fix that. That is all explained in their installation guide. Installation is a beginner level project. Anyone who can strike a line and manage a handsaw can install it, and replacements are simple. 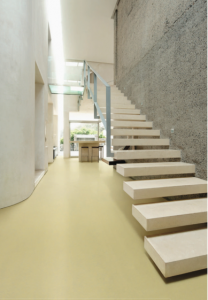 The top wear layer of Marmoleum Cinch Loc is made from natural ingredients like linseed oil, limestone, and rosin. As a green and natural product it is a great to use for children’s play areas and recreation areas. The Mayo Clinic recommends hardwood or linoleum flooring, especially if your child has asthma or allergies. Marmoleum, being a natural linoleum flooring, is also referenced by the Environmental Protection Agency in a study of Emory University’s hospital flooring choices (spoiler: they chose Marmoleum). The core of Marmoleum Click 3 Cinch Loc is a moisture-resistant wood core. While it still requires an inexpensive vapor barrier under it to protect from vapor in the concrete, spills are no problem. The backing of Marmoleum Click 3 Cinch Loc is cork. Renewable, sustainable, and natural, it provides a wonderful cushioned feel to the floor, making it ideal for long periods of standing. It comes in a wide variety of colors and designs. Free samples are available. According to Forbo.com, “Thanks to its natural ingredients Marmoleum Click reaches room temperature quickly, ensuring your house is snug and warm. Our Marmoleum Click floors can even be used with underfloor heating. It is a tactile floor covering and comfortable under feet, ideal to live and play on. Have your basement finished before you even know it. Since Marmoleum Cinch Loc Click 3 is easy install, you can save a lot of money by doing it yourself. This is the Marmoleum product that DOES NOT require an experienced installer. See different color schemes with the Green Floor-Plan Designer. Marmoleum maintenance is easy. Each tile comes with a “Topshield2” finish, which protects your floor from scratches. In addition, the tiles can be regularly vacuumed, but sweeping and spot cleaning is what most people find works best. Marmoleum can also be wiped down using a damp cloth, cleaned using some Forbo neutral floor cleaner, or buffed as needed. Check out Forbo’s maintenance guide to find out what the best practices are for long-term care of your new basement flooring. Also, Green Home Floors has the products and advice you need to keep your floors looking good for many years. Any type of flooring is just one part of having a basement that you love. Whether you turn the basement into a game room or a home office, Marmoleum can be a great choice. Order a free sample today or give us a call at 844-356-6784 for a consultation or technical support. Find the lowest prices on Marmoleum at Green Home Floors. Still have questions? Check out our Marmoleum FAQs. Marmoleum flooring comes in a wide variety of designs. This entry was posted in Marmoleum for the Basement! and tagged allergies, asthma, basement, cinch loc, eco-friendly, flooring, marmoleum on April 21, 2017 by Jay Artieri. What Chemically Sensitive Flooring to Choose? Chemically Sensitive Flooring is a hot subject today! Not only are there a lot of children with asthma, allergies and chemical sensitivities today but a growing population of adults. Many young adults leave home for college and find what in their dorm room? CARPET!!! What could be worse for a healthy person or an asthmatic or allergic than cheap industrial carpeting. With the backing holding all kinds of glues that offgas to the positive charge in plastic fibers that attracts every contaminant on the planet, there is nothing good about carpet. Statistics of kids with these conditions can be alarming. In fact the EPA report on asthma is not kind at all to building products like paints, glues and carpeting and especially to plastics like vinyls. Once considered something that children would outgrow in time, the incidence of chronic asthma, allergy and chemically sensitivity is now starting to impact young and old alike. It is alarming to see the rapid growth in these illnesses in adults in just the last few years according to the AAAAI statistics pages. So what would be a good chemically sensitive flooring product for those with asthma, allergy and chemical sensitivity? Oddly enough it would not be anything you can buy in a home center and it would not be anything new or made of any type of petrochemical based plastic… that is for sure. Good old fashioned linoleum is the first and most reliable choice recommended by doctors who treat these illnesses. When it comes to linoleum today that brings you to Forbo, the only international company making old fashioned, original recipe, linseed oil based flooring. In fact they still make it the same way it was made in 1860. Rolled out like pie dough and pressed onto jute backing this colorful, natural plastic is all natural and spectacularly beautiful as well. What is even more remarkable today is the fact that Forbo has combined their Marmoleum with the floating floor concept that has been around for many years. The benefit to that is simple. Easier installation that can be done by diy-ers and novices. The product requires a little basic carpentry cutting and fitting experience but simply snaps together without tools or tapping blocks and is really worth its weight in gold when it brings relief to a person with asthma, allergy or who is chemically sensitive. Simply gluing the flooring to the backing in the factory means that very little if any off-gassing is taking place in the factory. Marmoleum Click is the product that really has changed life for so many people today. Do you need more information… take a look at the Forbo Environmental Product Declaration that discusses eco-toxicity and the impact on human health. This entry was posted in Chemically Sensitive Flooring and tagged allergies, asthma, chemically sensitive, flooring, healthy, safe on April 14, 2013 by MClique. Healthy flooring alternatives? Why do I even care about that? A lack of healthy flooring alternatives might be a significant factor in the number of people that are complaining these days about allergies and asthma. That can be quite astounding if you start to pay attention to this problem that is on the verge of epidemic. What might be the most amazing is that people are typically spending more time and money suffering or taking medicine that compounds the problems than trying to take the bull by the horns, especially when it comes to kids. How many folks rush their children straight to the specialist rather than let things run their course naturally. The doctors are all too quick to provide inhalers, steroids and antihistamines to settle health problems that can generally be attributed to carpet and rugs as well as lots of other things hiding in our homes. Generally, much of what we are being exposed to is plastic or a derivative of plastic or petroleum and our bodies are simply not equipped to combat the huge volume of these volatile chemicals being thrown at us. A good resource for understanding some of this is found here at this site with information from the EPA; Indoor Air Quality or see their video on Indoor Air Quality below. Ultimately it will be up to the manufacturers to make healthy flooring alternatives since the government and our legislators can not even begin to control this problem. Don’t think for a second that your government or anyone for that matter except your mother might know what is best for you. In fact, it has been proposed that most men do not have the sensitivity to odor to protect themselves and their families from chronic or even acute chemical hazards. If you think about it, most men live shorter live and most tradesmen are men. This is no coincidence. There is a theory that men, having done all the smelly jobs like fighting, burying the dead and butchering animals for thousands of years have lost much of their natural sensitivity to odor or can turn it off as a coping skill. Men seem to be in charge of most building product specification and purchasing and are typically the ones who are saying “what are you worrying about” to their partners or clients. Using healthy flooring alternatives that are bacteriostatic like linoleum can prevent the growth of many harmful bacteria and that is the reason it is used in hospitals and schools. Additionally, linoleum after it’s natural oils have cured in the factory has virtually none of the off-gassing from composite flooring and other products that require the use of solvent based adhesives. The adhesives used with linoleum flooring leaves little in the way of chemical smell to bother people after the installation. This entry was posted in Flooring, Health & Wellness and tagged allergies, asthma, choices, flooring, healthy, kids on March 9, 2013 by MClique.